The Mexican Grand Prix features some of the best atmosphere of any F1 circuit and most of the grandstands offer views to match. The lack of any real general admission option and being confined to a ‘zone’ are the only areas where the venue really falls short. Popular grandstands sell out fast. Buy tickets from these official retailers. 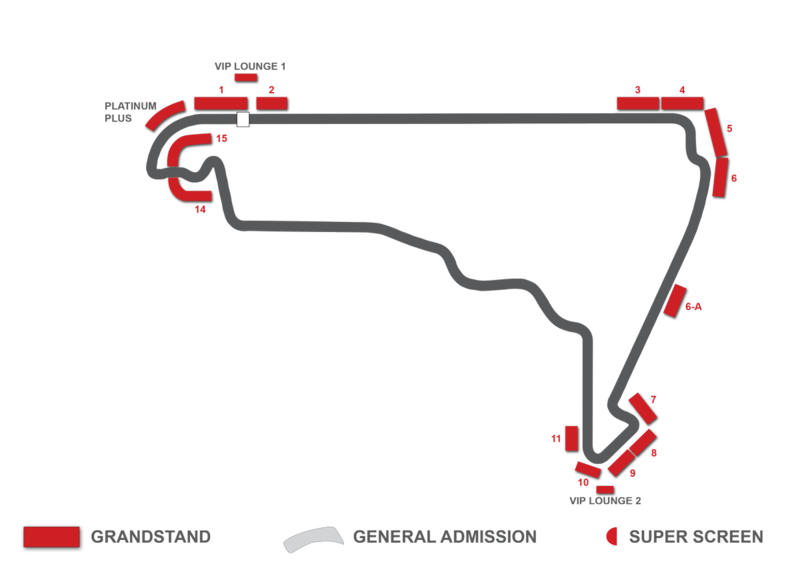 Mexico’s esses have long been a fantastic spot to appreciate the swift change of direction of a Formula One car and with a very long main straight and DRS assistance you’re almost certain to see overtaking moves here, as well as a high chance of spins and smashes, especially on lap 1. Spectators here follow the action from turn 1, through the sweeping turns 2 and 3 before they accelerate off down the back straight. Grandstand 3 borders the breaking zone into turn 1 as the cars break from over 300 to just over 100kph in the blink of an eye. With its clear view down the main straight, its the perfect place to see overtakes unfold and it benefits from close proximity to the track. The view through the esses though is of the rear and side of the cars, which doesn’t appeal so much to some. Of Grandstand 4 and Grandstand 5, the latter has the best view. Both are a bit distant from the track because of the run-off area but Grandstand 5’s head on view of the approach, breaking hard into turn 1 and slithering through turns 2 and 3 is very satisfying and one of the best at the track. Grandstand 6 is a little distant from turn 1 and lacking any view down the main straight, but the angle of approach through the esses makes for some pleasing shots and fans here are in the best place to witness the acceleration down the back straight. With so many fans packed into the area around this section of track its like a second stadium section. While it may not be as instantly recognizable as the Foro Sol, its one of the most popular places to watch F1, and for good reason. The view from grandstands 9, 10 and 11 features one of the most expansive views at the circuit, from breaking from nearly 300kph into the 90 degree left-hand turn 4, and onward to the tight turns 5 and 6. From here you’ll witness the immense acceleration of F1 cars as they charge off towards turn 7. All grandstands have a similar view with just slightly different angles of the same section of the circuit, however grandstand 10 stands out as a step above the rest as from these seats you’ll have a view directly down the straight that forms the approach. It doesn’t get much better. Historically home to the banked, high-speed Pereltada, where one of the circuit’s namesakes – Ricardo Rodríguez – lost his life. The first part of the iconic corner may be gone now, but in its place this part of the track now boasts an iconic grandstand section. A baseball stadium was built here in the 1990s and the track has been re-profiled to cut through between grandstands 14 and 15. The two huge grandstands that make up Foro Sol, wrap around the final section of track from where the cars enter at turn 12, snaking around turns 13 and 14 to disappear between the crowd. The slow tight nature of this part of the track means that the racing through here is not the most exciting but it is a great vantage point to photograph the cars. The cherry on top is having the podium celebrations and post race interviews take place here, making this perhaps second only to Monza the for prize of best podium in F1. In fact with the pre-race festivities and the podium presentation it has the feel of a main straight grandstand. Nowhere else at the circuit is the famous Mexican Grand Prix atmosphere as vibrant as it is in these grandstands and it has to be considered by any F1 spectator to the to be one of the best grandstands at the track. There’s not a lot to choose between grandstands 14 and 15, the track views being about the same. Grandstand 14 has a section of the stand that is covered so if you want less sol in your Foro Sol this the section for you. Note that some of the seats on the very top rows of grandstand 14 and 15 have their views somewhat hampered by the giant screens so its probably best to avoid these. Tip: If you find the seat numbering on these stands confusing that’s because it is. Only every third step is numbered but keep a look out for numbers as you climb up through the rows and you can’t go wrong. Make no mistake, though sold as a general admission ticket with a general admission price tag – this is the cheapest ticket option for the event – this is by no means general admission in reality. Far from being able to explore all areas of the circuit and get a wide variety of views, fans here are confined to one grandstand on the nondescript straight between turns 3 and 4. Lower rows will have a distant view of turns 3 and 4 but some of seats in the upper rows have their view obstructed by trees. At half the price, this would be too much to pay for a view that, even for only one day, would leave you wishing you’d stayed at home. For three days, really they should be paying you to sit here. This one is for masochists only.